My film-loving husband James has always had a deep connection to Jaws. 70s cinema is his favourite, Spielberg high on his list of best directors. He was the first person to introduce me to Jaws (and many other classics like it), on a summer night not unlike those in which Jaws is set. The film quickly became one of my favourites too. We waited patiently for our son to come into our lives and when he did, he only ever had one name, even before he was born: Hooper. When it came time to plan Hooper's first birthday, we were always going to have a Jaws theme. It was a marvellous opportunity to get creative and celebrate both the film we loved and the son we adore (and to a lesser extent, surviving our first year of parenthood!). Our invitations were PVC boxes with an ocean floor, a shark lurking in the depths below a stylised 3D-printed "Orca" that our friend made for us. A labour of love constructed entirely whilst Hooper slept, so some of the trimming completed after midnight was a little wonky! The majority of the decor we made for the party was out of paper and fabric, two things we have in abundance in our craft cupboard. I aimed to strike a balance between authentic references to Jaws for the die-hard fans amongst us, and decorating in a simplified style that wouldn't be "too intense for younger children". We started with the downloads available for purchase from HelloMySweet (https://www.etsy.com/au/listing/130534435/jaws-shark-party-beach-closed-sign?ref=related-4) which added a layer of realism - much of our decorating centred around the awesome Amity Island banner that has become synonymous with Jaws-themed parties. It was the first thing guests saw when they entered the room, and everything else referenced the colours in the banner. 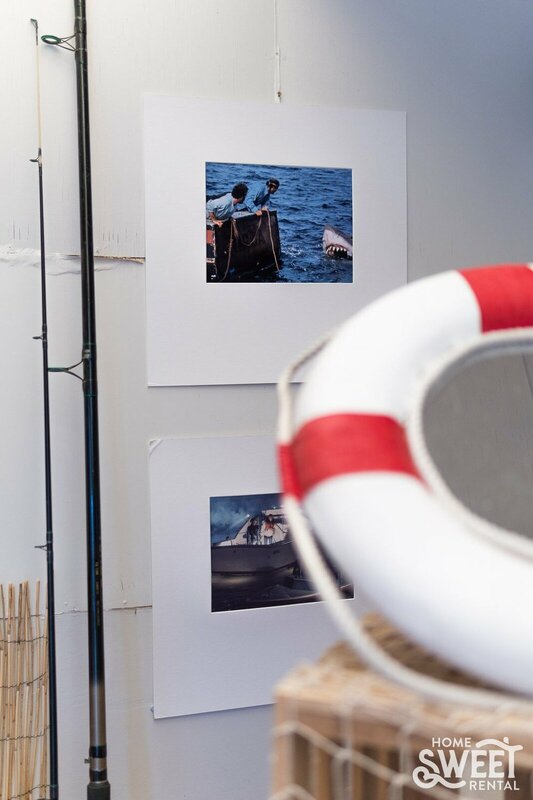 Some of my favorite decor choices were the reed fencing behind the buffet, the vignette of the lobster trap, lantern, buoys and crab in the centre of the table, the boat rental sign and the "Amity means Friendship" noticeboard where we put up a photo from every month of Hooper's first year. Also effective was the fabric draped from the rafters, with silhouettes of sharks floating above, and the buoy chandelier we made out of paper lanterns and red paint. 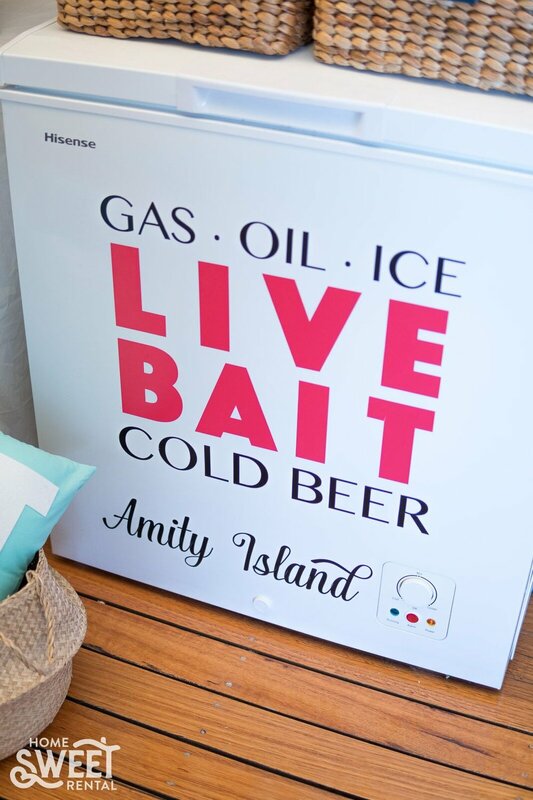 I spontaneously designed and cut out a vinyl decal for our chest freezer which will most likely stay there forever because we enjoy it so much - although we are yet to track down the cold beer (or the live bait for that matter). I was also quite proud of the party bags which included a kit to learn to tie a Sheepshank Knot, aka "basic seamanship". The project that was the most time-consuming was "Quint's Bar", a display over the top of the bar table which included an "Orca" ribbon banner made out of layered cardstock and foamcore. I spent almost two hours trying to recreate the same typeface as what is on the back of the boat in the film. And then there was the display of shark jaws that needed to be "kid-ified" a little as the film depiction at Quint's place was pretty bleak; they are attached to paper plaques in different shades of blue. The jaws are made of paper (several layers, glued together) and by tying them in a certain way, they took on a curved, dimensional quality. I feel like I know far more about the dental work of sharks now than I ever intended to. The white Orca vinyl decal that we put on our Esky (or cooler) was based on a really awesome illustration I discovered on Dribbble by Matteo Luzzini, and went so well with the 2D graphics we selected for the invitations and tags at the party, it was like it was meant to be. Hooper wore a t-shirt on the day that said "I'm in sharks", which only one of our guests recognised, so that probably wins for the most inside baseball reference of the lot. As with all great parties, we spent hours planning and preparing for it only for it to be over in the blink of an eye (kind of like the past 12 months). And now the question remains, how can we top this for the sequel, birthday number 2? !